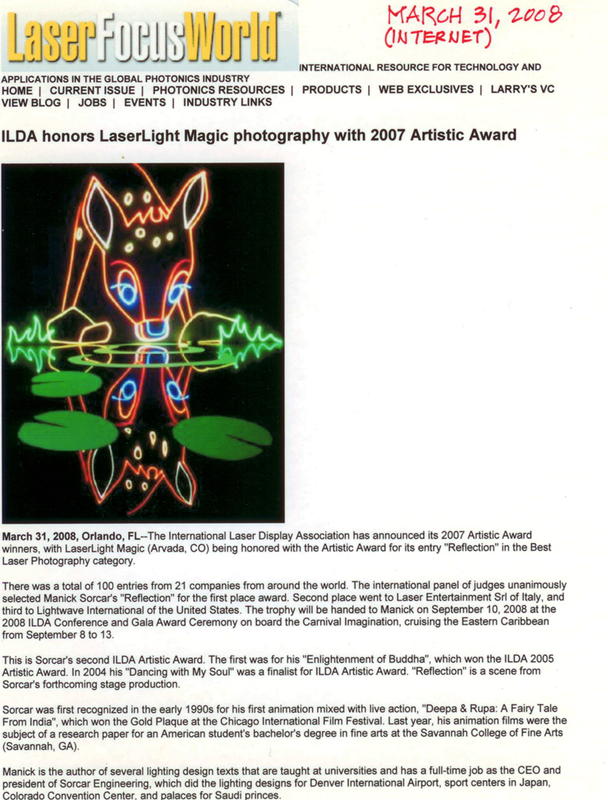 Manick Sorcar wins his second "ILDA Artistic Award"
International Laser Display Association officially announced today, Manick Sorcar’s company LaserLight Magic, won the "ILDA 2007 Artistic-Award" for their entry "Reflection" in the category for best “Laser Photography”. There were a total of 100 entries from 21 companies from around the world in different categories. The international panel of judges unanimously selected Manick Sorcar's "Reflection" for the First Place in the Laser Photography category. The second place went to Laser Entertainment Srl of Italy, and third to Lightwave International of the USA. The trophy will be handed to Manick on September 10, 2008 at the 2008 ILDA Conference and award ceremony on board the Carnival Imagination, cruising the Eastern Caribbean from September 8 to 13.
the Carnival Imagination, cruising the Eastern Caribbean from September 8 to 13. ILDA's awards for artistic and technical excellence, the industry's equivalent of Hollywood's Oscars, each year honor companies from around the world for artistic and technological achievement. This is Manick Sorcar's second "ILDA Artistic Award". The first was for his "Enlightenment of Buddha" which won the "ILDA 2005 Artistic Award" at Rimini, Italy. 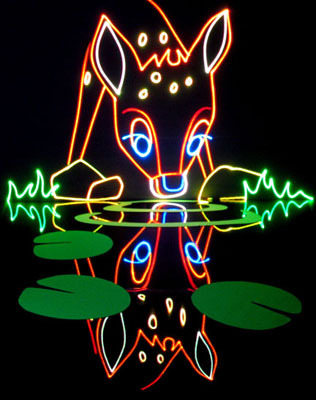 In 2004 his "Dancing with My Soul" was a Finalist for ILDA Artistic Award - both of those were for "best use of laser on stage with live action". "Enlightenment of Buddha" was an extravaganza of dance, drama, magic in combination with various forms of intelligent lighting, life-size laser-animation and three dimensional laser effects in space. The story took the audience to 600 BC India, where a meditating Siddhartha Gautama (whom the world would later know as Lord Buddha) under a Banyan tree, remained undisturbed and attained enlightenment despite constant disruption from enemy Devaputra Mara and his string of bone-chilling, intimidating black magic. "Reflection" is a scene from Manick Sorcar's forthcoming stage production. This was his first entry in laser photography category, which won him the first place and the prestigious award. Manick is the author of several lighting design texts that are taught at universities and has a full-time job as the CEO and president of Sorcar Engineering Inc, which did the lighting designs for Denver International Airport, sport centres in Japan, Colorado Convention Center, and palaces for Saudi princes. By night, he is an artist and animator.